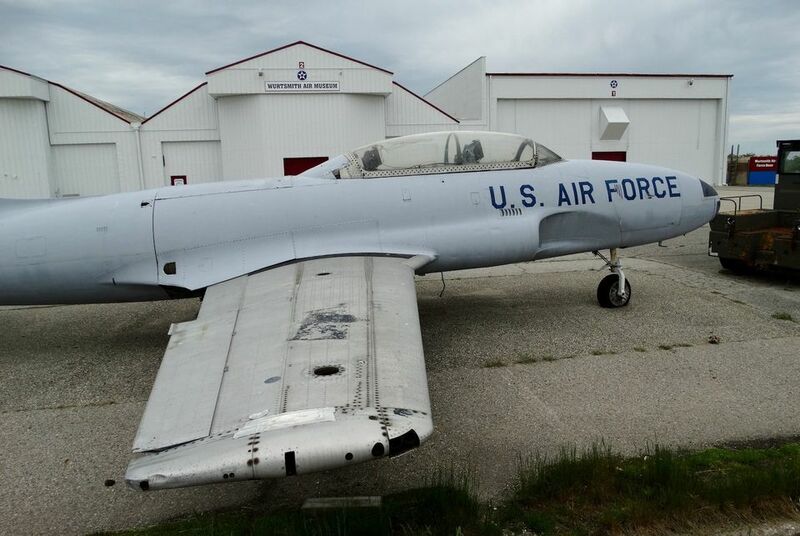 An old fighter jet outside the Wurtsmith Air Museum on the former Wurtsmith Air Force Base grounds in Oscoda Township on Wednesday, June 1, 2016. The base closed in 1993, but dozens of township residents were advised not to drink their well water by state and local health officials this year after new residential well testing showed concerning levels of perfluorinated chemicals (PFCs), which were once used in fire-fighting foam at the base. Editor’s Note: The article below is one of many we’ve referenced over the years detailing the US Military’s efforts to shirk its responsibility for cleaning up water pollution it has caused. The military has been notorious for playing fast and loose with environment safety and quick to abandon the messes it makes. The incident described below is one of many that have been reported recently regarding the very serious and difficult-to-remove water pollution caused by fire fighting foams.–Hardly Waite. OSCODA, MI — The U.S. Air Force says it won’t provide safe drinking water to Oscoda residents affected by chemical pollution from the former Wurtsmith Air Force Base because a Michigan law seeking that is discriminatory. The Air Force Civil Engineering Center coordinating Wurtsmith cleanup says the service branch is “not authorized” to comply with the requirements of Michigan Public Act 545 of 2016, a new state law which took effect in January. Air Force spokesperson Mark Kinkade said the federal Comprehensive Environmental Response, Compensation, and Liability Act (CERCLA), which created the Superfund program, only compels the U.S. government to comply with state law if it’s not discriminatory. “The Michigan law does discriminate as it only applies to federal and state agencies, not to all entities and persons,” Kinkade said. As result, the “Air Force is not authorized to comply with the mandates of Act 545 to provide an alternative water supply or to reimburse the state of Michigan when it provides an alternative water supply,” he said. Public Act 545 amended Michigan’s Safe Drinking Water Act to require the state or federal government provide an “alternative water supply” to any Michigan property owner with a polluted well if state health officials issue a related drinking water advisory and the government caused the pollution. Sen. Jim Stamas, R-Midland, sponsored the bill after military officials told him at a meeting last year that the Air Force would provide alternative water to affected properties if Michigan amended its laws to require that. Messages left with Schuette’s staff late Friday were not immediately returned. The Air Force claims the Department of Defense prohibits it from spending money to provide safe water unless a private well tests for chemical concentrations above the U.S. Environmental Protection Agency health advisory level. In Oscoda, toxic fluorocarbons called perfluoroalkyl substances (PFAS), or perfluorinated chemicals (PFCs) — the official scientific name is in flux — have been leaching through from the base for decades. The chemicals were in firefighting foam the military began using in the 1970s but the plumes that resulted weren’t discovered until the late 1990s. The nuclear B-52 bomber base closed in 1993 after the Cold War. The chemicals are considered “emerging contaminants” because their threat to human health is worrisome but still somewhat uncertain. They have been tied in animal testing to thyroid, kidney, liver, reproductive and other health problems. Plumes of PFAS have spread across much of Oscoda near the base, into neighborhoods with many seasonal homes not connected to municipal water, which is safe. The main focus is on perfluorooctanoic acid (PFOA) and perfluorooctyl sulfonate (PFOS), the only two of 19 different PFAS plaguing the area that the EPA has established advisory levels for. In Feb. 2016, state and local officials issued an advisory, urging homeowners with a private well near the base to seek an alternative water supply. However, only two properties since then have tested for PFOS or PFOA at concentrations above the EPA threshold, which was formalized last May at 70 part-per-trillion (ppt). Total PFAS, however — both PFOS, PFOA and the other 17 different variations of the chemical class — has tested at 20,000 ppt in some wells and the groundwater under large parts of Oscoda south and east of the base is testing between 50 and 300 ppt. The plumes have also moved south of the Au Sable River and east of Van Etten Creek — two waterways previously thought of as natural buffers. Site investigators say they still don’t know the full extent of the plumes. Meanwhile, Air Force refuses to pay for permanent safe water. “We should at least know that cost and start thinking about doing that while we do other work,” he said. Kildee speculated the sheer scope of the military’s PFAS problem around the world is tied to the Pentagon’s reticence to spend more in Oscoda. More than 600 current and former U.S. military installations are now dealing with a plume problem related to the use the PFAS-laden Aqueous Film Forming Foam (AFFF), which the military and airports around the world have used since the 1970s to quash jet fuel fires. The Air Force may be “concerned about how big this problem might be and if they commit to a really robust response here they may have to provide the same size response everywhere,” Kildee said. Denise Bryan, health officer with the local District Health Department No. 2, said many Oscoda residents feels victimized and exasperated with the Air Force. Health risks associated with the chemicals are either unknown or have troubling consequences, yet “no money has come forward for the residents,” she said. Bryan has helped organize the fourth in a periodic series of town hall meetings about the pollution, happening Tuesday, April 25 at Oscoda Methodist Church. Representatives will attend from the Air Force, the Michigan Department of Environmental Quality and Department of Health & Human Services. An open house is 2 to 4 p.m. and the meeting is 6 to 8 pm. Providing updates — including progress toward reestablishing a local Restoration Advisory Board to coordinate cleanup efforts with Oscoda Township officials — is the main purpose, but Bryan thinks the meeting serves another one.